So, what does a false widow spider look like? As the name suggests this little beasty bears some resemblance to the infamous black widow spider. However, on closer inspection the false widow does not have the jett black colouring of its notorious cousin and red markings are swapped for cream markings on the abdomen. 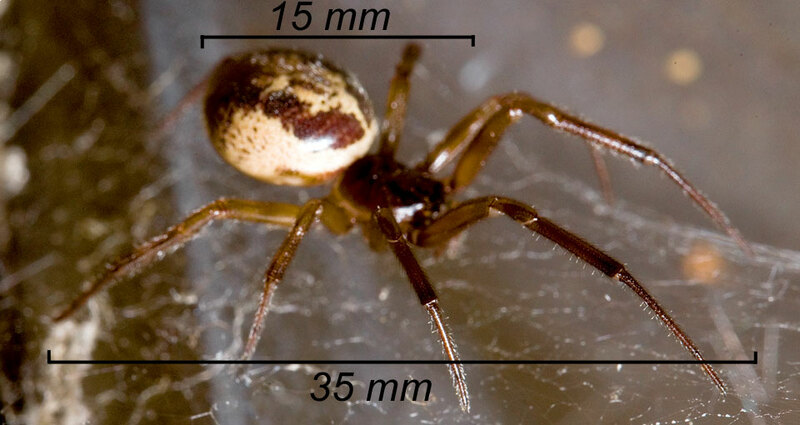 The false widow is a medium sized spider, approximately the size of a 50 pence piece. The body ranges from around 7mm to 15mm in length and the leg span reaches up to 35mm. The body and legs have a glossy appearance. The thorax and legs are a dark / orangey brown colour, unlike the pitch black of the true widow spiders. The abdomen is fairly bulbous with cream patterning on top. It is said that these markings resemble a skull in S. nobilis. False widows are largely nocturnal, spending the day hidden away in a deep crack or hole adjoining its web. False widows like dry, relatively warm environments where they are not likely to be disturbed. This inevitably brings them indoors and they are most often seen in sheds or outbuildings. Interestingly, these spiders seem to have a preference for south facing walls. The web is an irregular tangle of fine, sticky silk fibres of high strength. The spider will spend its evenings upside down in this web.